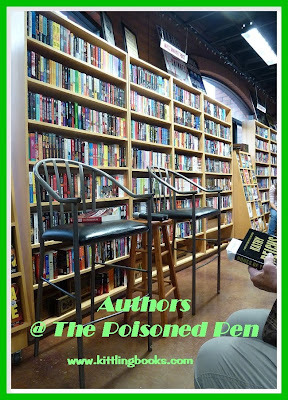 @ The Poisoned Pen with Author Rhys Bowen! It's Saturday of the Labor Day weekend, and I'm tooling across Phoenix on the way to The Poisoned Pen to see Rhys Bowen, author of the Evan Evans, Molly Murphy, and Royal Spyness mystery series. Phoenix is the sixth largest city in the United States, it's Saturday, and the streets are practically deserted. I wonder where everyone is while the Jeep keeps a steady speed, going through one green light after another. The thought runs through my mind that I hope everyone stays where they're at so my trip home will be as smooth. I walk into my favorite bookstore, say hello to all the familiar faces, choose my seat, and sit down to read until the festivities begin. As others begin to arrive, I'm reminded that Bowen had requested everyone to wear a hat. There's judging to be done and prizes to be won. I have some sort of phobia about having things on my head, so I wasn't in the running for any of the prizes-- unless it was having the whitest hair in the group. 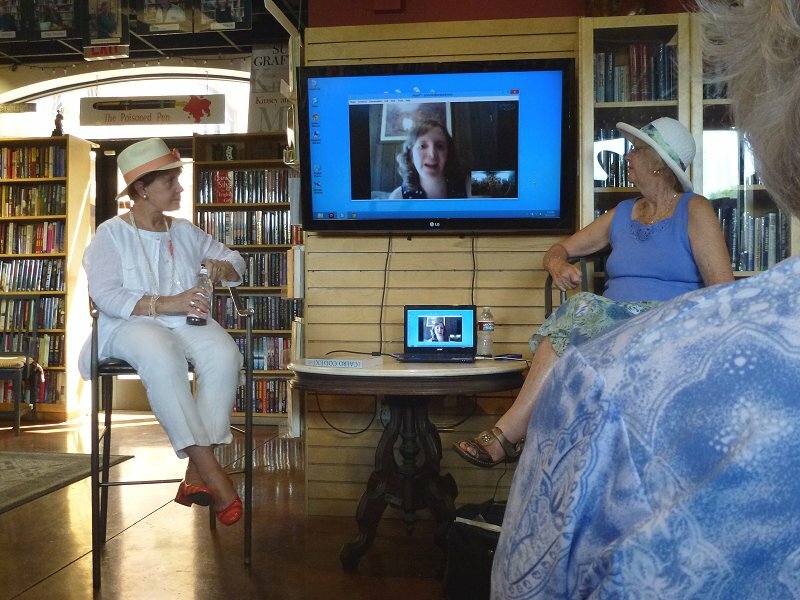 Part of the author event includes a chat with Lauren Willig via Skype, so while we wait for Lauren to finish primping and appear on screen, Rhys begins with an apology about the refreshments: "Lady Georgiana would never serve iced tea. I'm so sorry!" We all laugh and acknowledge the truthfulness of the remark, but we Americans tend to prefer our tea cold (especially here in Phoenix during the summer), so it didn't keep us from the drinks table. 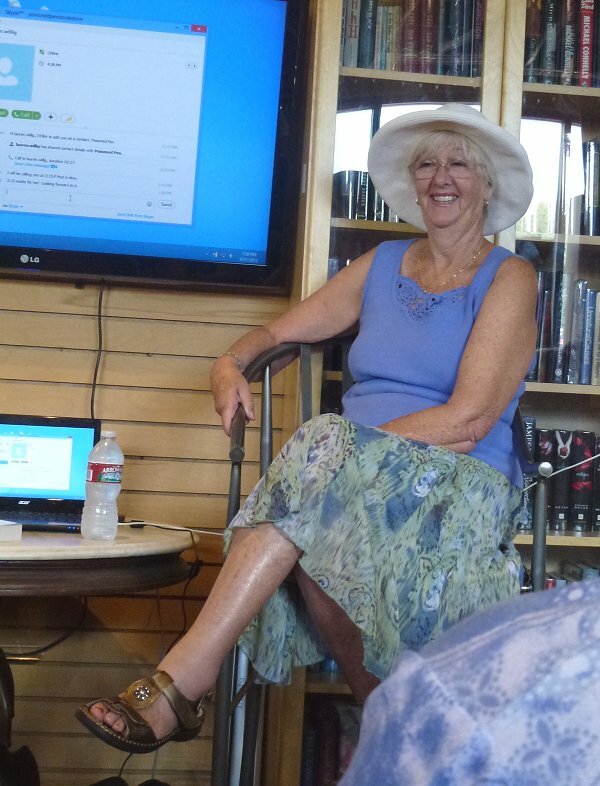 Bowen gives us a brief preview of her next Molly Murphy mystery which will be published in March 2014. Tentatively titled City of Darkness and Light, this book will have Molly Murphy going to Paris. Bowen loves the Impressionist painters and has often wondered what steered artists away from depicting scenes of serene beauty to other areas like Surrealism and paintings which show people with blue faces and the like. Molly will be getting a taste of the art scene in March, and we'll all get to join her. It is now time to judge the hat contest. The winner is a young woman who is wearing a stunning hat adorned with peacock feathers that she purchased when the film Titanic was released. "The original price of my hat was $150, and I bought it for $15 at a Nordstrom's back East," she tells us. The runner-up is a woman who really got into the spirit of the contest. She was dressed in 1930's glam from head to toe-- including gloves. Everything's over so quickly that I have no chance to take photos. Drat! "I can't seem to stay away from..."
Lauren comes into view on the large screen in front of us. Bright and bubbly, she tells us that she'll soon be writing the first "Pink Carnation" book that takes place partially in the United States. Several fans have asked when one of these romantic thrillers would be set on these shores, and they're going to be getting their wish! Willig then talks about her next book, A Summer Engagement. It's her second standalone novel and will be released in May 2014. "I can't seem to stay away from dual timelines," she says with a laugh. The two timelines are the summer of 2009 and the same season in 1849-- the beginning days of the Pre-Raphaelite Brotherhood-- and concerns a lost Pre-Raphaelite painting discovered in a house in 2009. I like dual timelines, art, and goodies found in old houses, so I circle the book title in my scribbled notes. In a flash, Lauren was gone, and the action shifted back to Rhys Bowen. "You've written a real country house mystery." 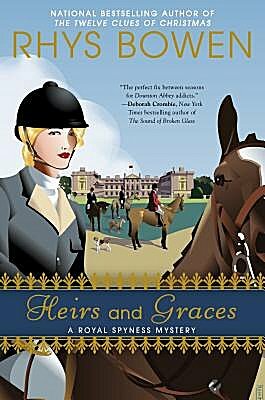 In talking of Bowen's latest book, Heirs and Graces, Barbara Peters says, "It seems to me that you've written a real country house mystery." Bowen agrees and tells us a bit about the latest adventure of Lady Georgiana Rannoch, thirty-fourth in line to the throne of England. Georgie's mother's memoirs are not going well. It seems she's having a problem selecting which memories to include. "Oh no, not that night. It would bring down the government." "Noooo... that wouldn't set well with the Pope." And while this meandering is going on, Georgie gets to leave the freezing cold castle in Scotland to stay at a beautiful country house. Once again, she's been summoned by the Queen. An heir has been found in Australia, and Georgie's prime directive is to knock all his rough edges off and teach him all the proper etiquette. Like Jacqueline Winspear's Maisie Dobbs series, Rhys Bowen's "Royal Spyness" books mirror "the Long Weekend"-- that period of time between World Wars I and II. Many of the royal tidbits are based on fact, and Bowen shares one. Lady Mountbatten once left her two daughters at a Hungarian hotel for six months because she couldn't remember in which hotel she'd left them. With historical precedence like that abounding, "...is it any wonder that we all tend to go batty in England?" Bowen says with a laugh. The smile continues as she dangles another tantalizing tidbit in front of us. She's just finished the rough draft of the next Royal Spyness book-- and Georgie will finally be coming to the United States. What a treat! "The Queen will be so disappointed..."
Rhys Bowen was born in Bath, England. Queen Mary and the princesses spent a lot of time at nearby Longleat during the war to be away from the bombing in London, and the Queen loved to go to Bath to search for antiques. She was quite adept at getting marvelous items for a song. The antiques dealers in Bath-- after losing some costly pieces to her-- soon learned to hide all the good stuff down in their basements whenever they learned that she was on her way to town. Bowen's father owned a large paper company, and met Queen Mary on more than one occasion. At one of Queen Mary's appearances, she was walking along, automatic polite smile and royal wave in full gear, when she spotted Bowen's father. Queen Mary paused, a big smile spreading across her face as she waved enthusiastically to Bowen's father. "Queen Mary's reaction made my dad's life," Bowen says with a fond smile. "A lot of things that happen to Georgie happened to me in my own life." Bowen is a veteran traveler. She goes on tour with one small carry-on, and the hat she's wearing in the photo gets packed in that case. "When I'm on tour and in a different hotel every night, after three days I forget my room number. I've learned to take a picture of my door with my phone." You could hear that little piece of advice getting filed away in a lot of minds! Bowen stopped writing the Evan Evans series set in Wales when some of the books began going out of print. She felt there was no point in continuing the series if readers couldn't get their hands on all of the books. (The author married into an aristocratic family and does speak Welsh. Everyone in Wales must learn Welsh until the age of eleven, and it's possible for those who wish it to continue their education in Welsh all the way through university.) "After four or five Evans books, I wanted to write about someone a lot like me," she says, and thus the Royal Spyness books were born. Bowen closes out the event with two stories. Both are hilarious. "I already have a job, and I'm thinking of buying Safeway." "Well then, maybe I could be your gardener." We haven't recovered from laughing at the Safeway tale when Bowen hits us with her best shot. Queen Elizabeth was making an appearance at a hospital, and in one of the wards she stopped to talk with an old man. "What seems to be wrong?" the Queen asks the old man. He looks up at her from his bed and exclaims, "I have huge boils all over me testicles!" Without the slightest flicker of a change in her facial expression, the Queen wishes him a speedy recovery and moves on to the next ward. She's barely left when the hospital staff descend on the old man. "What on earth were you thinking?!? You simply cannot speak that way to the Queen!!!" A month or so later, the Queen's sister, Princess Margaret, visits the same hospital... and the same ward. Stopping by the old man's bed, Princess Margaret asks him what's wrong with him. The old man looks at her for a second or two then says, "I have boils all over my... stomach." Princess Margaret looks at him and replies, "Oh dear. The Queen will be so disappointed to hear they've spread." It takes a while for the laughter to die down inside The Poisoned Pen. I leave soon thereafter and make good time along the still-deserted streets, but all the while I'm thinking, "I could follow Rhys Bowen for the entire tour just to listen to her tell stories!" Cathy - Oh, what a nice evening!! I really must try this series; I like Bowen's Evan Evans series very much. I enjoyed Evan, too, and I'm happy to know why that series came to an end. What a fun event! I take a picture with my phone when I park in a parking garage but never thought of it for a hotel room number. I could've slapped my forehead when she told us that! Fantastic! I'm new to Rhys Bowen, but I've enjoyed Lady Georgiana's antics. Can't wait to get further into the series. I look forward to reading more of Georgie's adventures, too!